Inspired by the beautiful panna cotta I had at the Botanist Gin dinner, I wanted to make a panna cotta dessert for the holidays. 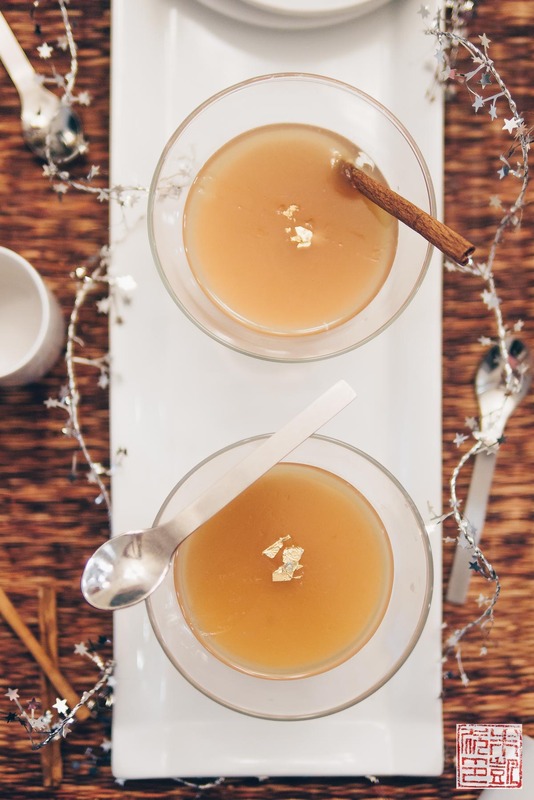 Since I had apple cider for Thanksgiving in the house, I used this recipe from Food and Wine to make some vanilla apple cider panna cottas. 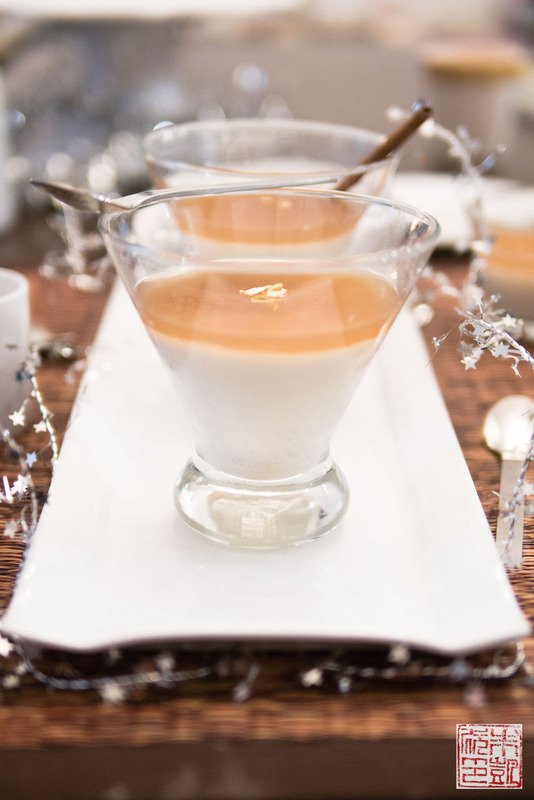 The vanilla and cinnamon give the panna cotta a holiday flavor, and the layer of apple cider gelee makes a nice contrast with the smooth creaminess below, especially if you use spiced apple cider. If you want to make them in regular ramekins, you can unmold them by dipping the bottoms in hot water for about 30-45 seconds, running a thin bladed knife around the edge, and inverting onto a plate. However, I really like the presentation in glasses as it shows off the layers nicely and reminds me a bit of those fancy cocktails I used to love getting so much at restaurants! It’s mid afternoon here and everyone is winding down and getting ready for Thanksgiving. If you’re traveling, safe travels. I’m looking forward to staying cozy at home with my family and enjoying a long holiday weekend. Have a warm and happy Thanksgiving! In a small bowl, sprinkle the gelatin over the water and let stand until softened, about 2 minutes. In a large saucepan combine cream, half and half, sugar, vanilla bean and seeds, and cinnamon stick, and bring just to a simmer over medium high heat. Let simmer for about 15 minutes, stirring regularly to prevent scorching. Remove saucepan from heat and strain into a bowl. Stir in gelatin mixture until melted and fully incorporated. Divide mixture among 4 individual size ramekins or glasses. Cover and refrigerate for at least 4 hours or overnight until the mixture has set. Put cider and sugar in a medium saucepan and boil the cider until it has reduced to ¾ cup, about 15 minutes. Sprinkle ½ teaspoon of gelatin over 1 tablespoon of water and let stand until softened, about 2 minutes. Whisk the gelatin into the cider mixture until fully dissolved. Transfer the mixture to a measuring cup with a spout and let cool about 30 minutes. 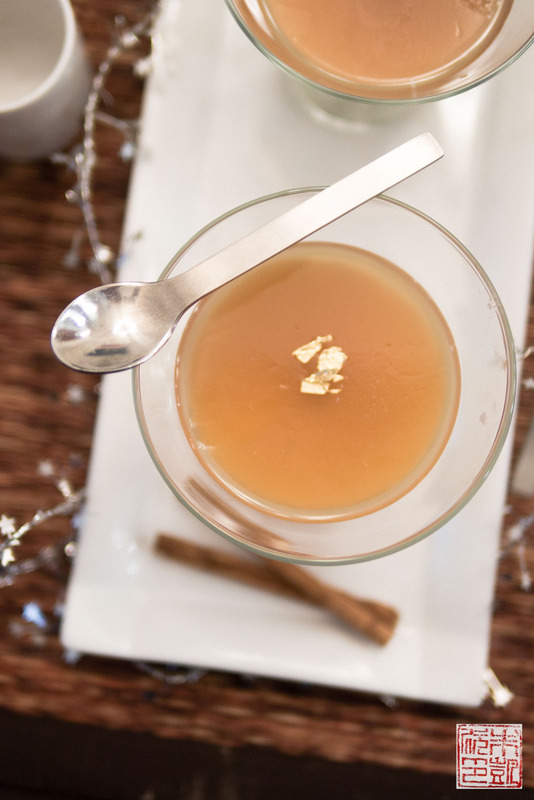 Gently pour 2 tablespoons of the cider over each panna cotta over an inverted metal spoon. Refrigerate until set, at least 2 hours.